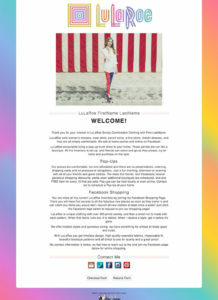 Get a FREE LuLaRoe Consultant Basic Website with any of our subscription levels, Even the Trial Subscription. It’s our way of saying thank you for considering us. Creating your website requires no technical knowledge, it’s so easy. Included in your Free Website is the ability to have your own custom Logo, up to 5 pictures slide show, area to enter a few paragraphs about your LuLaRoe business, active contact details. You even get a custom web address that will look like: www.BeFabulous.us/FirstLastName, All for free. We even can include the link to your Loyalty Rewards Card (with a paid subscription) so potential customers can enroll in your Loyalty Rewards Program from there encouraging these potential customers to buy from YOU! Also with a paid subscription you can include a YouTube video as well. So sign up today to any of our subscription levels and get your FREE easy to customize LuLaRoe Consultant Website.